Melchizedek Church of Sacramento, California is hosting their 9th annual Ladies Conference, "Bold & Beautiful", which will be held on March 10-12, 2016. 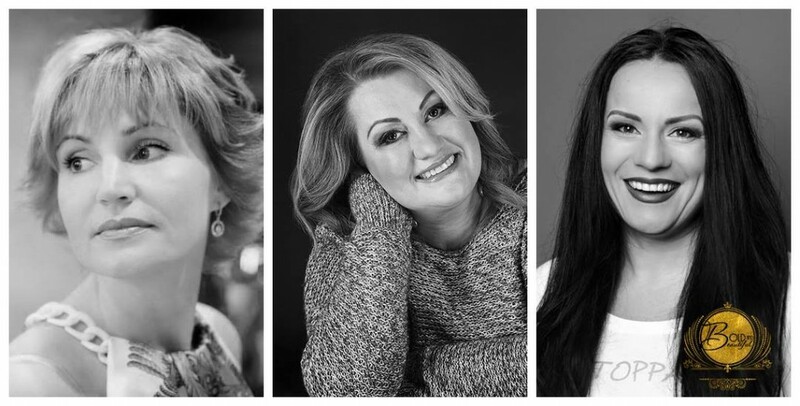 For this special occasion, the speakers of the conference have participated in an interview to become acquainted with their audience: Olga Muzichuk, pastor of "Melchizedek Church" (Sacramento, USA), Vera Kasevich, pastor of Dynamo Church (Kiev, Ukraine) and Svetlana Spivakova, host of "Recipes to a Woman's Happiness" show (Kiev, Ukraine). Who did you dream to become in your childhood? Olga Muzichuk: As far back as I can remember, I always wanted to be a mom, and do charity work. Vera Kasevich: A journalist or an attorney. But I followed my grandpa's footsteps and became a musician, and after repentance, became a pastor. The latter was the most unimaginable. О.М. : Bible, of course. Also books about family, leadership and development of spiritual gifts. V.K. : Favorite is the one that you read over and over. I can only read one book over and over without getting tired of it. That is my Bible. < S.S.: Bible. Books on leadership and self-development. What qualities do you mostly value in others? О.М. : Their personality. Virtue, faithfulness, ability to love. V.K. : Sincerity and integrity; all other positive qualities flow out of these. Hypocrisy is probably what corrupts a person the most. S.S.: Christ, who can be concealed in the heart of a person for a time and unseen, but if they open their heart, every person becomes unique and beautiful in their own way. О.М. : I greatly enjoy worship and praise. V.K. : I am a child of the 80's and disco is still my passion, speaking of music. S.S.: Classical music, prophetic worship. What is your strongest and weakest character trait? О.М. : Strongest - sincerity and love. Weakest - I am very emotional. V.K. : I will start with the weakest - perhaps laziness. I was always very frank about it, and people always made fun of me, because they didn't believe me. But I know myself better than anyone... Speaking of strengths - I think it's my faith. I believe in God, I believe in people, I believe in the future and in myself, regardless of the circumstances. Maybe my name has something to do with it? [Vera = Faith, literal translation from Russian] S.S..: Strength - being sincere and open. Weakness - frequently respond emotionally. О.М. : I value my time with family and close friends, enjoying a cup of hot tea and fellowship. I also enjoy the time I spend one-on-one with God, it always relaxes, refreshes me, and brings forth new revelations and ideas. V.K. : Immensely enjoy quiet time reading, reflecting and listening to music. О.М. : Changes are good - it is a constant process of my life. I would like to rejoice more. V.K. : Life is an adventure, and if it is with God, then He will fulfill the desires of your heart. S.S.: My life is full of changes. A this point, I am expecting a new level in ministry. What does it mean to be a modern Christian woman? О.М. : Knowing who you are, knowing your God, the reason you are alive and what mission God wants to accomplish though you - and being ready to answer the call. V.K. : While living in this world, thinking and acting as if you're not of this world. S.S.: A woman as described in Proverbs 31 - a lady who is splendid, balanced, kind, strong and courageous. The things she does are secondary, the main value is who she is. Head of the family and an independent woman - can these two live in unity? О.М. : A woman was created for the man, to be his joy and comfort, to help him in the goals given to him by God. I believe that harmony comes though collaboration with each other and makes each one fruitful in fulfilling their calling. V.K. : A woman is always dependent on someone, and it up to her to choose whom. The wise woman chooses her husband to be in the lead, who is also being lead by God. That's when everything falls into place. S.S.: A woman was not created to compete and govern, but for partnership with her husband and God.